Venezuela's financial markets have tumbled after President Hugo Chavez promised to nationalise the biggest phone and power companies. The Caracas Stock Exchange closed nearly 19% down, with bonds also lower. 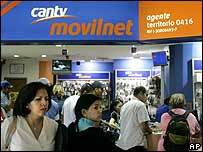 Telecoms firm CA Nacional Telefonos (CANTV) was suspended from trading after closing 30% lower, while power firm Electricidad de Caracas fell 20%. While Mr Chavez had outlined some of his plans, analysts said he had decided to go further than previously thought. "The news comes as a surprise, as we were under the impression that President Chavez supported direct foreign investments," said Bank of America analysts in a research note. Wall Street heavyweight Merrill Lynch said the situation was very serious. Mr Chavez, who is due to be inaugurated for the third time, unveiled his plans during a speech to the nation. "All of that which was privatised, let it be nationalised," he said, adding that the central bank's autonomy would be removed as part of wider plans to change Venezuela's constitution. The plans are all part of a wider changes aimed at developing a "Socialist Republic of Venezuela". Mr Chavez's announcement drew criticism from the US. "Nationalisation has a long and inglorious history of failure around the world," said White House spokesman Tony Snow. "If any US companies are affected, we would expect them to be promptly and fairly compensated," said Gordon Johndroe, spokesman for the White House National Security Council. The US state department said it expected Venezuela "to follow through on all of its contractual obligations". Foreign investors were shaken by the news, and shares were hit in Mexico where the main stock index lost 2% because a number of companies have close business links with Venezuela. Among the other foreign firms that are likely to be affected, are US power company AES and US phone firm Verizon, both large shareholders in Venezuela. AES lost more than 4% in New York, while Verizon was little changed. The changes would also end foreign control of crude oil refineries in Orinoco. Another factor hurting Venezuela's markets on Tuesday was a dip in the price of crude oil that threatens to dent the nation's most lucrative natural resource. 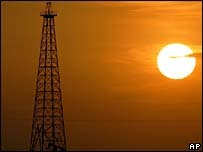 Earlier in the day crude oil fell below $54 a barrel in New York despite previous threats by oil group Opec that it may trim output, and a spat between Russia and Belarus that has hurt European supplies. Much of Mr Chavez's poverty plans have been based on securing money from Venezuela's energy sector.